The notion of rhizomatic learning has been good to me. As Ryan Tracy has recently mentioned, my thoughts about it have moved over the last eight years, but i still find that the story isn’t finished for me… and it is this sense of not being finished, of never being whole, of the learning process being forever uncertain that i find fascinating. 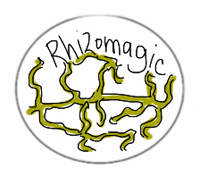 The notion of the rhizome is gathering interest, just today i saw links to medical education people interested in knowledge and a classroom teacher talking about freeing their work. Earlier this year I scheduled a 6 week course that turned into a community. It was a course scheduled around 6 questions, four of which were changed during the course itself. It found its strife and its curriculum from the community of folks who took time to make those questions and the people who moved around it. Those six challenges will still circulate in the background of this year’s course. But I, at least, am moving to the next conversation. One of the challenges of rhizo14 was that with me being the originator of the course, people still needed permission from me to go ahead and control some of the spaces of discussion. It also means that in describing how rhizomatic learning can be cultivated, we’ve only got my model to work with. I don’t suggest that everyone does stuff my way. We need more and more interesting models. I love those guys. Last year’s course was hosted on P2PU. This year when i went back to see what the course could look like, I found a new project being launched – course in a box. It’s a course replication engine. Follow the steps… and you’ve got your own copy of the course… like really got it. It’s yours. It’s automagically hosted with a company called github. No cost. Good licensing. And a few pretty funky technologies to do interactive stuff online. (i’ll leave tech stuff to a further post). You are now responsible for deciding who can do what in the course you have. So, in extended discussion with the excellent Vanessa Gennarelli (who had serious influence on the design of rhizo14) it occurred that this year’s course could use some of this technology to give people responsibility for their own work. Don’t like how the course is being fun FORK THE COURSE. Want to try a different way of talking about week three FORK THE COURSE. We could have any number of people who are running separate installations of the course. Everyone could move to a new one. I have this crazy dream that we could end the course with 5, 20 100 courses all running with different people, with different ideas of how to talk about rhizomatic learning. So rhizo14 already exists. The community that developed out of that course still works together and is one that I feel very privileged to be part of. We are starting over again. In late February/March of 2015 we’ll be starting a new discussion. I can’t say for sure how that will go, but i can say that the burning question that’s in my mind right now is ‘how can we talk about successes in rhizomatic learning?’ What happens when everyone else starts to play along? Who knows… Let the games begin. But for rhizo15, is this a more explicit way of creating diff sub-communities, for example? The ones who wanna read D&G, those who don’t? 😉 I still side with dont even though I did, if you know what I mean 😉 though i guess u can have really forkable things. Where ppl change topics completely or ways of engaging, etc. oh yes. the creating of subcommunities will be very explicit. frankly… they wont really be ‘sub’ communities. no such hierarchy will exist. And don’t forget Borges’ The Garden of Forking Paths. It all forks anyway. May as well encourage it. I also like removing the word “sub” so that it’s no longer a hierarchy (as Dave just said). Although, I don’t think I *meant* it as a hierarchy… more like global/universal vs local? Like a Venn diagram with intersections? Or is that too organized and neat for rhizomes? I certainly wouldn’t force people not to silo… but a fork is not a silo. it is, by it’s nature attached the the rest of the structure by its history. Forkin’ A is right, Keith! Cool ideas, Dave. This comment thread seems to warm up by the minute. Is this ‘forking’ simply what most folks did in #rhizo14, branch off into ‘tribe’ spaces? Would you be seeing this as a software embodiment of that natural forking? If so, I think there is a problem. I only have so much attention. Would I be splitting off a piece of that attention (you know, like Voldemort’s horcruxes) for each fork I was participating in or would it be more like the Red Queen exhorting Alice (you know, if you want to get somewhere else, you must run at least twice as fast) or would it be like the constant recursion in the facing barbershop mirrors (you know, our attention receding into them until it can’t be seen)? My hope (currently) is that people will push things back up the fork… though im still uncomfortable with both the conceptual and technical ramifications of this. In response to both Terry and Simon… (though Dave has already responded, but if we’re forking, then I have equal rights to respond I guess) – is that I think what Dave is suggesting is really what happens anyway (that diff people take the course in diff directions, form different silos – omigosh can you imagine building close relationships with 400 people in 4-6 weeks? that would be NUTS) – but by formally encouraging people to fork it he’s doing the “permission” thing and almost… “letting go” more formally… then again, because the forking would actually occur in such a way that the diff forkers could see what each other have done, it might allow for people to accept/reject ideas from others into their own… rather than totally ignore? Now how this all applies to rhizo15 I am not exactly sure, as I don’t even consider it much of a content-heavy space, so… maybe if I were running my own version of the course I’d just add blog aggregation (I find it useful elsewhere and it’s really quite simple to do if you get the correct RSS). But that’s not really “much”. I guess we’ll find out when we get there? Dave, the concept of rhizomatic learning was one big idea I got from #ETMOOC and have used it in professional learning with teachers in our district. Perhaps I’ll get a chance to see how the concept evolves in your work with learning communities and how others add to our understanding through those interactions. For me, in some ways, the concept is just a way of saying that connected learners will take learning in all sorts of directions because of their differences, experiences, common interests, place they are in at the time they are connecting with others, etc. It’s so helpful for educators to see that learning isn’t linear, regardless of what they’ve been forced into by the “test gods.” The concept also for me is indicative of “messy learning”. And so many teachers still have trouble with that. May the Rhizomes live on! It’s a useful story for some, and i very much appreciate that you feel like you have YOUR version of it. My feelings about it are similar to yours in that the deconstruction of ‘certainty’ and ‘the right answer’ is critical for learning and, further, democracy. That’s enough fun. You are all being much too silly. I have no idea what the fork I’m going to do until I start (and maybe not even then). A fork is industrial and a rhizome is organic, unpredictable, multidirectional…forkin is conceptually rigid and too prescribed. I agree with what you’re saying conceptually… but our experience tells us that an occasional fork makes it easier to keep things working. We simply couldn’t seem to keep the NO DELEUZE and YES DELEUZE camps in the same conversation… and constant translation slowed things down. So far the ‘theory’ fork seems to be working. Previous Previous post: You know what you need… you need a learning contract. Rhizomatic Learning is a group in Education on Mendeley.